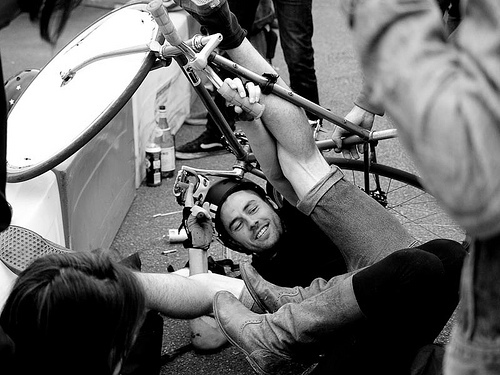 Best photo from the Euros 2009 | Birmingham Hardcourt Bike Polo, UK. Bonjour! Je suis upside down! I couldn’t find this picture when I posted photos from last summer’s tournament, but I managed to find it! The cowboy boots were apparently attached to an attractive French woman, which explains Fin’s charming grin and attempt at a helmet-doff. Anyway, following last week’s success, there will again be polo, this Sunday 14th November, 10am, Highgate Park. 9 people confirmed so far! This entry was posted in Birmingham Bike Polo and tagged bicycle, bicycle polo, bike, bike polo, birmingham, birmingham bicycle polo, birmingham bike polo, birmingham bike polo team, european bike polo championships. Bookmark the permalink.